The Eagles have added four new concert dates to their 2018 North American tour. Set to begin in Indianapolis, IN on March 12, the group will now perform in Salt Lake City, UT (May 3), Portland, OR (May 5), Spokane, WA (May 8) and Phoenix, AZ (Sep 8). An American Express Card Members presale runs Tuesday, January 9 at 10 AM through Thursday, January 11 at 10 PM local time, with general public tickets available Friday, January 12 at 10 AM local time. 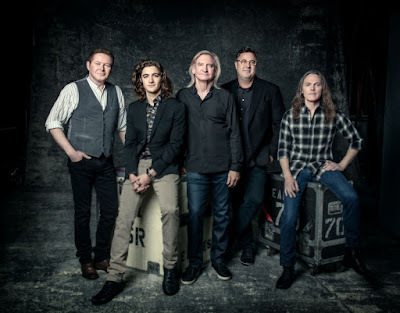 The 6-month run sees Don Henley, Joe Walsh and Timothy B. Schmit joined by the late Glenn Frey’s son, Deacon, and country star Vince Gill in the lineup following their first shows together in 2017. The 2-CD/1-Blu-ray Audio package that includes remastered sound, ten previously unreleased live recordings from the era, as well as hi-res stereo and 5.1 mixes. Presented in an 11 x 11 hardbound book, the set also features rare and unseen photos, a replica tour book, and an 11 x 22 poster. The Eagles were named the No. 1 Rock News Artist Of The Year and delivered the No. 1 Rock News Story Of The Year as part of their sweep of the 2017 hennemusic Rock News Awards.